After Brute Squad jumped out to an early lead, Molly Brown battled back in an intense semis match. While Lisa Picaithley’s kick spike turnover dominated social media, the reality is that smooth offense defined the rest of the first half. The teams traded eight holds until Brute Squad took half at 8-4. The entire first half lasted under a half hour, and Brute Squad had just four turnovers heading into intermission in a remarkable display of fast paced offensive efficiency. The teams traded holds until 9-5. Then they engaged in the first sloppy point of the game. Molly Brown turned it over three times on execution errors. After Brute Squad gave it back twice, they converted their third break chance of the point with Tulsa Douglas finding Lee for the goal. Brute Squad displayed incredible discipline and resiliency on this point, a theme that would reappear later in the game. Molly Brown held to close the gap to 10-6, and then Manuela Cardenas singlehandedly took over. Throughout the next four points, Molly Brown’s young Colombian recorded an OI break assist to Stacy Gaskill, assisted Jesse Shofner on a push pass, and then threw an incredible curving break huck assist that snuck back inbounds at the last second. All four points ended in Molly Brown breaks. All of a sudden it was 10-10. During this four break run, Brute Squad played POTY contender Kami Groom on offense. And Cardenas took on that superstar matchup and forced Groom to cover her on a turnover. “Manuela is one of the most challenging covers I’ve ever faced,” said Groom. “It’s a matter of being on your toes all the time, and being ready to try your best to contain her.” Despite Brute Squad’s best efforts, Cardenas was the brightest star on the field, finishing the game with a healthy five assists, while playing both major offensive and defensive points. At 10-10 with the momentum and the roaring crowd in Molly Brown’s favor, Brute Squad called a timeout. “[Former coach] Mike Zalisk just came in and was smiling. 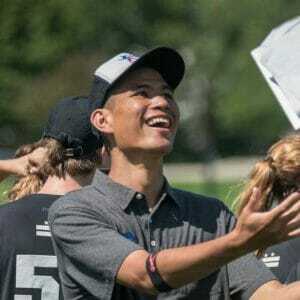 He’s really intense a lot of the time, but when you see him smiling, you know…it’s fine, we’re having fun and we love each other,” said Brute Squad’s Jojo Emerson. Zalisk’s message certainly calmed the team down and flipped the switch. Brute Squad responded with a clean hold; Emerson threw a pretty OI flick break assist to Lien Hoffmann. Then Brute Squad capitalized on a Molly Brown overthrow as Groom assisted Lee to give Boston a 12-10 lead. Cardenas responded by going every other for most of the next offensive point. She got the pre-assist on a Alika Johnston goal to close the gap 12-11. After a turnover-free Brute Squad hold, their defense forced three Molly Brown huck turnovers on the 13-11 point. And much like the 9-5 sloppy point earlier in the game, Boston converted on their third break chance. Lee caught her third goal on a tipped disc to give Brute Squad the 14-11 lead. 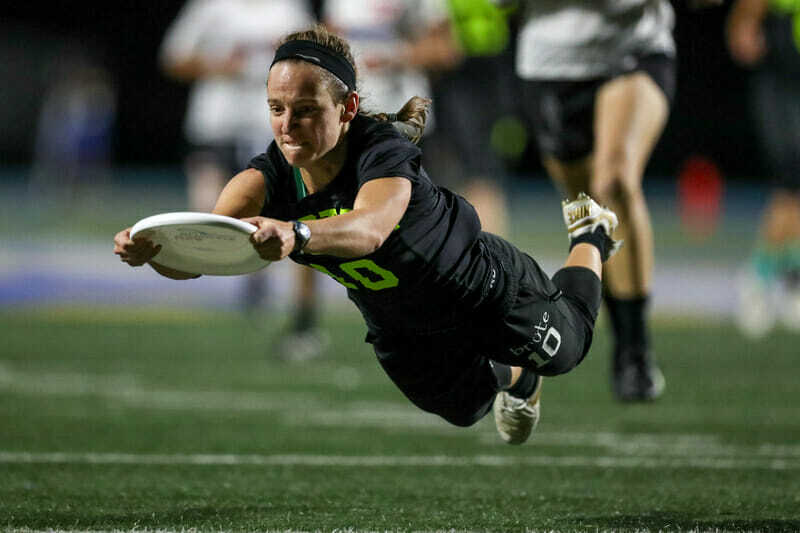 On the next point, Shellie Cohen shut down Molly Brown’s dominator, and Aly Steinfield reeled in the semifinal winning goal, setting up a titanic rematch in the final: #1 undefeated Boston Brute Squad vs. #2 defending national champion San Francisco Fury. Comments on "Brute Squad KOs Molly Brown in Semifinals for the Fourth Straight Year"